Caitlin Miron, a PhD student in the chemistry department at Queen’s University, interviewed on CTV News. Image credit: CTV News, image composite from screen captures. Congrats to Ms. Caitlin Miron, Ph.D. Candidate, Queen’s University for making a groundbreaking discovery that may have the potential to prevent cancer cells from spreading. Have a watch and read of the CTV news report, “(with video) PhD student makes groundbreaking discovery that may prevent spread of cancer“. According to Miron’s interview with CTV news, “85% of cancers” may benefit from this discovery and while it is too early to talk about the time frame of a commercially available drug, about 5-8 years was mentioned. “Studying at the European Institute of Chemistry and Biology in Bordeaux, France, Miron was able to use advanced screening technology to examine a number of compounds from the Petitjean lab at Queen’s University. During her internship, she was able to discover one compound that binds well to four-stranded DNA structure, or guanine quadruplex [G4], which has been linked to the development of cancer and other diseases. She explained her discovery by comparing a single-stranded DNA to a necklace with beads that move along it until they hit a knot. The beads are the cell machinery that move along the necklace processing the DNA, she said. Scientists have been researching quadruplex binders as a possible treatment for cancer for approximately 20 to 30 years, the PhD student explained. However, many of the known binders haven’t yielded results as promising as the one Miron has identified. P.S. Here are some additional references. Ref 1: Miron is scheduled to have an upcoming Queen’s University Grad Chat “November 28th, 2017 – Caitlin Miron (Chemistry)” that I’m very much looking forward to listen to. Caitlin’s doctoral dissertation is titled: Dynamic recognition of unusual nucleic acid architectures by cation-responsive switches and other metallo-organic platforms. In sum, DNA has been found to adopt unusual architectures. One type of architecture, called a guanine quadruplex, has been shown to form in the promoter regions of oncogenes (cancer genes), and is implicated in cancer. Caitlin’s research involves finding molecules that stabilize quadruplexes, thereby blocking the expression of these oncogenes, in the hopes that these molecules can be used as anticancer therapeutic agents, either alone or in combination with other treatments. In her first internship in Dr. Mergny’s lab, Caitlin tested a library of potential binders originating from the Petitjean lab and identified a compound that shows some of the best stabilization of quadruplexes that has been seen over the past 30 years. During her second internship (funded by the Mitacs Globalink program), Caitlin explored the effects that small modifications of the lead compound’s structure might have on guanine quadruplex recognition. By taking these compounds from expert to expert, she was able to identify suitable biophysical techniques that she has since brought back to her lab at Queen’s to further her research. Since then, preliminary results suggest that these compounds inhibit cell growth in several human cancer cell lines, and earlier this month, a patent was filed on the novel compounds Caitlin first investigated in France. These results serve as but a case example of rewards made possible by the financial support of funding agencies such as Mitacs. As a final note, Caitlin recommends getting into labs with big names in their respective fields, if possible. Dr. Mergny is one of the top researchers in Caitlin’s field. For Caitlin, conducting research in Dr. Mergny’s lab and having access to experts has enabled her to develop a better understanding of her work and accelerate her research. Comparison of sequencing data with theoretical sequence distributions suggests that there is a selection against G-quadruplex prone sequences in the genome, probably as they pose real problems during replication or transcription and generate genomic instability (see below). Nevertheless, “G4-hot spots” have been found in certain regions of the genome: in telomeres, in repetitive sequences such as mini and microsatellite DNAs, in promoter regions, and in first exons of mRNAs. There might be a specific positive role for these sequences that compensates for the general selection against G4 forming sequences. Our goals are to understand the factors that modulate these effects. A number of proteins that interact with these unusual structures have been identified, including DNA binding proteins, helicases, and nucleases. We are currently developing a fluorescent-based assay to follow the activity of helicases in real time (Mendoza, Nucleic Acids Res. 2015). G-quadruplex ligands: Treats or tricks? And sometimes, even during the toughest and highest competitions like the Olympics, there can be selfless acts! Here is one selfless act that I LOVE in 2006! At the end of the day, winning must NOT be everything. Thank you Norway, thanks for helping us but more importantly, how to behave in a selfless manner. You guys rock! World class athletes don’t just set examples by how many medals they have or how many world records they’ve broken, the selfless-act by Norwegian coach Bjørnar Håkensmoen inspire us to rise up to be more, to be noble. Here is an ad capturing the essence. Yesterday, on Reno KRNV News 4 Forum, I and others expressed some strong views about Lance’s actions. The discussion start at about 5:09 (click here to jump directly to the spot). I will never want to leave someone without means to make a living and be destitute. 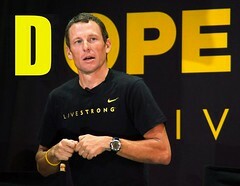 But Lance has made enough money (I will leave the morality of how he made those money for you to judge) for him and his family to live comfortably for life, so I am safer to be blunt in saying I have enough of Lance and don’t want to see him compete ever again and him promoting/selling anything. I respect my friends who are deeply affected by his story of fight against and winning his battle with cancer. But for me, I know people with cancer who behaves totally honourably without needing to resort to and falling so low as to try to win at all cost. Note 1: If you ask me, Lance’s latest strategically targeted & planned TV appearances is nothing other than an insincere attempt to win back our broken hearts. Yes, his battle against cancer, his great charitable work, his drugs-assisted wins, his bullying, and all his lies are paradoxically inspiring, hurtful and insulting all at once. And Lance has #fail to win me back. Note 2: Think of jousting, it was a sport that people from opposing groups “compete” in a manner that sometimes could result in deaths just to show who is “better” in the sport. 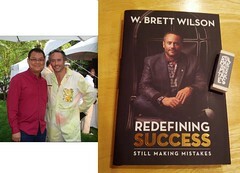 Over the last four years since June 2008, I’ve the pleasure to interview Brett Wilson (businessman & philanthropist, “Dragon with a heart”) many (see my 2008 pre-Dragons’ Den interview videos) and many times. I also slowly get to know Brett from industry events (we’ve met at Banff World Media Festival quite a few times (see 2009 interview)) and from his annual charity garden parties (thx Brett for inviting me & my better half). I can honestly say the “up close & in person” Brett is pretty much the same nice & straight talking no non-sense guy that many viewers of CBC’s award-winning Dragons’ Den have come to know and love. Earlier this afternoon, I had the pleasure to conduct an insightful, open and frank video interview with Brett to talk about his Globe & Mail best-selling book “Redefining Success: Still making mistakes“! 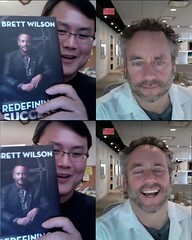 I hope you enjoy my interview with Brett as much as I in conducting it. Please share this article & video. And comment too. Danny Hillis of Applied Minds (company) is a really cool and interesting inventor and entrepreneur. Danny was a really good friend of Feynman and worked with him. The following TED talks are quite interesting and insightful. Danny Hillis: Understanding cancer through proteomics (2011) Hmmm, proteomics looks cool. Rethink Breast Cancer presents: Your Man Reminder App. The free app that uses hot guys to remind you to check your breasts. HT to my friend Michelle, Rethink Breast Cancer team member and artistic director of Breast Fest. “Researchers […] today reported promising results of a world-first cancer therapy trial in renowned journal Nature. The trial is the first to show that an intravenously-delivered viral therapy can consistently infect and spread within tumours without harming normal tissues in humans. It is also the first to show tumour-selective expression of a foreign gene after intravenous delivery.